(Nanowerk News) Flexing graphene may be the most basic way to control its electrical properties, according to calculations by theoretical physicists at Rice University and in Russia. 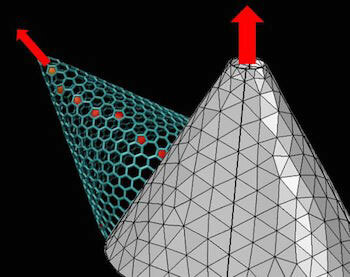 The Rice lab of Boris Yakobson in collaboration with researchers in Moscow found the effect is pronounced and predictable in nanocones and should apply equally to other forms of graphene. The researchers discovered it may be possible to access what they call an electronic flexoelectric effect in which the electronic properties of a sheet of graphene can be manipulated simply by twisting it a certain way. The work will be of interest to those considering graphene elements in flexible touchscreens or memories that store bits by controlling electric dipole moments of carbon atoms, the researchers said. Perfect graphene – an atom-thick sheet of carbon – is a conductor, as its atoms’ electrical charges balance each other out across the plane. But curvature in graphene compresses the electron clouds of the bonds on the concave side and stretches them on the convex side, thus altering their electric dipole moments, the characteristic that controls how polarized atoms interact with external electric fields. The researchers who published their results this month in the American Chemical Society’s Journal of Physical Chemistry Letters ("Flexoelectricity in Carbon Nanostructures: Nanotubes, Fullerenes, and Nanocones") discovered they could calculate the flexoelectric effect of graphene rolled into a cone of any size and length. The researchers used density functional theory to compute dipole moments for individual atoms in a graphene lattice and then figure out their cumulative effect. They suggested their technique could be used to calculate the effect for graphene in other more complex shapes, like wrinkled sheets or distorted fullerenes, several of which they also analyzed. “While the dipole moment is zero for flat graphene or cylindrical nanotubes, in between there is a family of cones, actually produced in laboratories, whose dipole moments are significant and scale linearly with cone length,” Yakobson said. Carbon nanotubes, seamless cylinders of graphene, do not display a total dipole moment, he said. While not zero, the vector-induced moments cancel each other out. That’s not so with a cone, in which the balance of positive and negative charges differ from one atom to the next, due to slightly different stresses on the bonds as the diameter changes. The researchers noted atoms along the edge also contribute electrically, but analyzing two cones docked edge-to-edge allowed them to cancel out, simplifying the calculations.